This one’s for the Ubuntu fans. The BQ Aquaris M10 includes a 10.1-inch touchscreen display. Under the hood, it packs an ARM CPU made by MediaTek, 16GB of storage, and 2GB of RAM. In addition to Wi-Fi, the device includes a headphone jack and SD card slot. There’s a micro-HDMI port for HDMI out and a micro-USB port with OTG support, so you can connect the tablet to full-size-USB devices, like keyboards, mice, and flash drives. Bluetooth is also available for wireless peripherals. You can buy the Aquaris M10 with a full HD screen for €279.90 (about $320) or get a lower-resolution model for €229.90 (about $262). Like many modern tablets, it’s a solid-but-lightweight piece of glass and plastic.But what’s really interesting here isn’t the hardware, it’s the software. 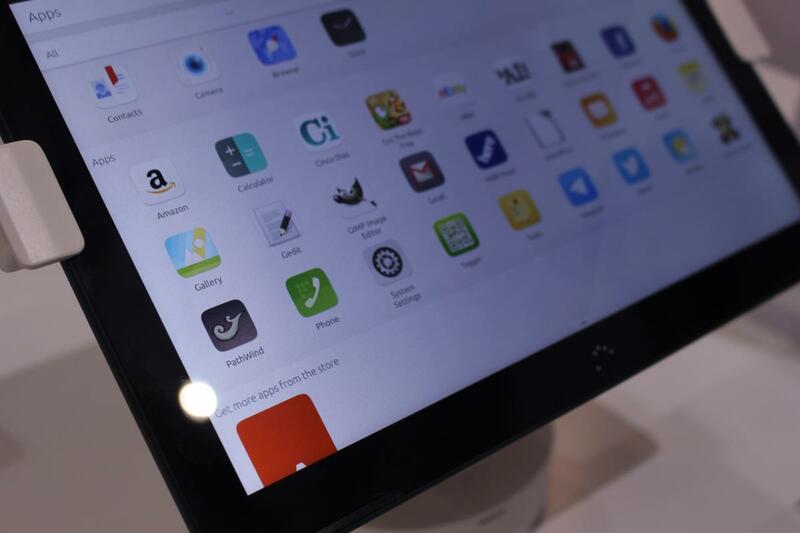 As the first Ubuntu tablet, officially supported by Ubuntu’s developers, it’s a one-of-a-kind device. 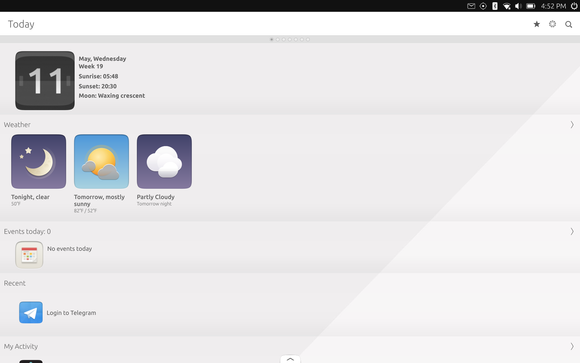 The inaugural Ubuntu tablet doesn’t run the mature Ubuntu desktop that Ubuntu fans are used to. 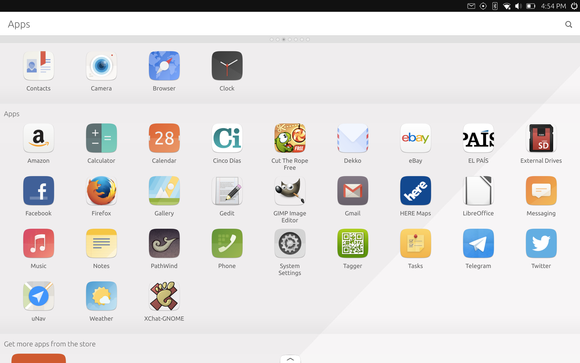 This is Ubuntu Touch, as seen on Ubuntu phones. The OS runs the Unity 8 desktop with Ubuntu’s Mir display server, and truth be told, this software isn’t ready for prime time yet. That’s why it isn’t easily available in the recently released Ubuntu 16.04 LTS and won’t be the default desktop in the forthcoming Ubuntu 16.10 release. Put simply: It isn’t stable yet. The experience here can be rough at times. The animations aren’t always smooth and there are noticeable hitches, especially when running multiple apps at once in desktop mode. I experienced several freezes, requiring a hard reset to recover. The tablet also inexplicably failed to find my Bluetooth mouse even though a nearby laptop could see it. I ended up connecting a mouse with a USB OTG cable. At one point, the Wi-Fi wouldn’t connect until I rebooted. But this is the state of Ubuntu, shipping today, on actual hardware. It feels like the development platform Ubuntu developers will be building on. Unity 8’s Scopes are designed to provide easy access to information without requiring apps. It’s worth emphasizing that this won’t necessarily appeal to Linux fans who want the Linux desktop and all that traditional software on a convertible tablet. Most of the apps included here are the same “converged” apps that appear on Ubuntu phones. Yes, the apps can scale up to fill larger interfaces, but it’s a markedly different experience than Ubuntu on the desktop. The device doesn’t even ship with a file manager, much less a terminal. The included apps are very cloud-centric, and prefer that your data be stored on remote servers where they can interact with it. The Aquaris M10 is targeted at a general audience, but isn’t yet ready for that audience. You can go out of your way to install a terminal app, but the root filesystem is mounted read-only. This means no installing packages with apt-get. Setting up a full development environment will be difficult, which is ironic—soon you’ll be able to set up a development environment on a Windows 10 tablet with Ubuntu’s bash shell more easily than you can on Ubuntu’s device. Some apps, like Gmail, are just glorified Web apps. While much about the platform is new, the OS includes several powerful, traditional Linux desktop applications: the Firefox browser, LibreOffice office suite, GIMP image editor, gEdit text editor, and XChat-GNOME IRC client. These old X11 apps run on the Mir display server through a technology called XMir. But these applications aren’t really optimized for the tablet. The first time I launched LibreOffice, for instance, the interface froze and I had to hard-reboot the tablet, after which LibreOffice opened fine. However, I discovered there’s no way to open an on-screen keyboard with these desktop apps, so you can’t use LibreOffice or, say, Firefox in tablet mode. That’s right: You have to connect a physical keyboard to type in these applications. Windows 10 offers a taskbar button you can tap to make an on-screen keyboard appear for older desktop applications, but Ubuntu offers nothing of the sort. The good news is that Ubuntu’s developers are working on fixing this. As a platform, it’s great that Ubuntu is always being refined. But, as a product that BQ and Canonical want to charge you money for, the Aquaris M10’s software needs more time to bake. Other little issues with the software also need fixing. There’s no way to hide the on-screen keyboard if it’s open, so you can’t minimize it to see more of the screen—it will always appear if you focus on a text field. On the lock screen, the password or PIN field isn’t selected by default. Whenever you turn on the screen, you first have to tap the small password or PIN field before you can start typing your code. This gets old fast. These may seem like nitpicks, but it’s all part of a general lack of polish throughout the interface. Apps like LibreOffice don’t even look like they fit in. This is the first device where Ubuntu really delivers on its vision of convergence. In fact, BQ’s official product website proudly proclaims this device “the world’s first convergent tablet” because it combines two different interfaces that allow you to use it as a tablet or a PC. But a lot has happened since Ubuntu started its convergence quest. Ubuntu lost the race. Windows 10 is already here, and it offers a converged experience on mobile devices. Unlike Windows 8, Windows 10’s new Universal Windows Platform (UWP) apps can run full-screen in tablet mode and in windowed mode on the desktop. You can walk into any electronics store and purchase a Windows tablet with an Intel chip that can run all the old Windows desktop software, and you can easily spend less than a BQ Aquaris M10 will cost. Windows 10 is more polished, too. Still, Ubuntu’s convergence is certainly here. Connect a keyboard and mouse and you’ll get a Ubuntu desktop environment. It looks a lot like the Unity 7 desktop environment Ubuntu users know, but it’s still Unity 8. All the same apps that normally display in full-screen mode appear in windows, with full keyboard and mouse support. Apps like LibreOffice are actually usable once a physical keyboard is present. Connect a keyboard and mouse and you’ll get a windowed desktop interface. On Windows 10, you can install practically any program, including many of the same open-source programs that run on Linux. A few desktop programs—like LibreOffice and Firefox—are present by default, but it’s not yet possible to install just any old Linux desktop app. 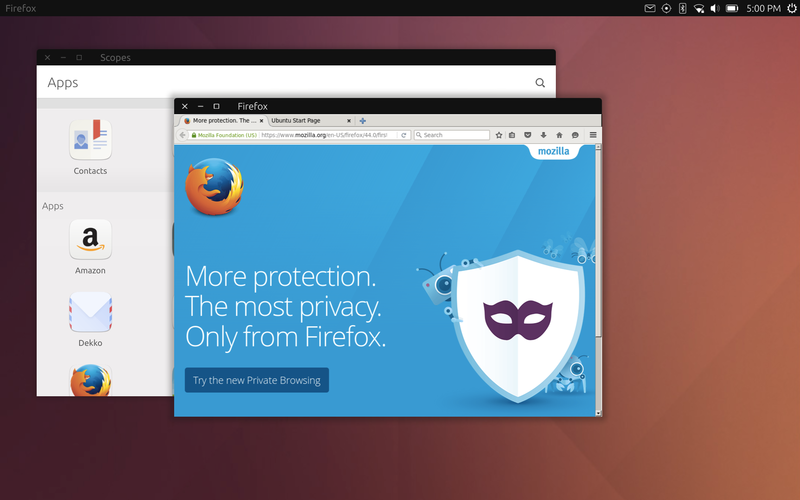 This should be made possible by Ubuntu’s Libertine project, but it’s still a developer preview. This particular tablet’s use of an ARM chip means there’s no hope of its ever running the library of Linux games on Steam, Minecraft, Skype, or any other closed-source app that needs an Intel chip, even if it could run in the new interface. That’s a lot of negativity, but those are the facts. Windows 10 beat Ubuntu to the convergence game and currently offers a more polished experience. The BQ Aquaris M10 is in an awkward place. It's still too rough-hewn for the general consumer market, but it’s also not a good fit for Linux geeks who want to run the whole universe of Linux desktop applications and set up development environments with powerful command-line tools. If you’re an Ubuntu fan who wants to see where things are going, someone who wants to report bugs and help contribute, or especially someone who wants to write apps and Scopes for Ubuntu’s new interface—then yes, this could be a worthy purchase. It’s a development platform that lets you stay up-to-date with how Ubuntu Touch is progressing and use the OS on actual supported hardware. But go in knowing exactly what you’re getting: a development platform that remains a work in progress. In the long term, it’s great that Ubuntu and the free software community can offer a compelling alternative to Windows 10 for use on tablets and convertible devices. That mission certainly deserves support.